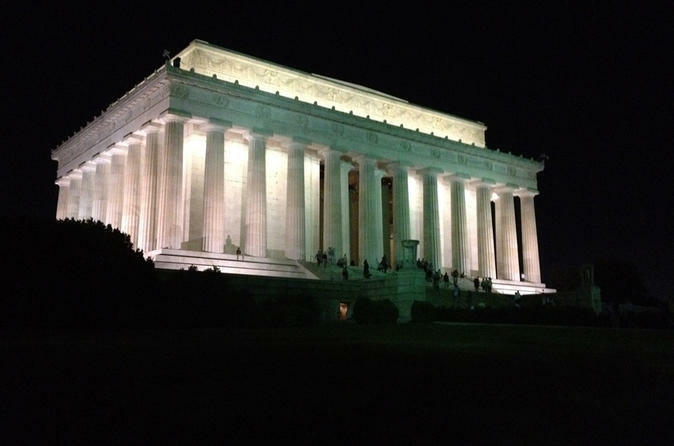 Explore the famous monuments and war memorials of Washington, DC by the light of night on this private, 3-4-hour, sightseeing tour. Hop aboard a comfortable van and enjoy an educational and entertaining narrated history of the nation’s capital. See the White House and the United States Capitol, plus the Lincoln Memorial, the Vietnam Veterans Memorial, the Martin Luther King, Jr. Memorial, the National Mall, and more. It’s a great way to see the DC region and its many attractions — a truly unique look at the iconic monuments of Washington, DC by night. Welcome to the nation's capital — Washington, DC — home to historical memorials, monuments, great institutions, and beauty that makes each day a special event. The evening tour begins with local hotel pickup, then a visit to Capitol Hill for a stop at the United States Capitol Building. Ride along the National Mall to see the Smithsonian Museums and the Washington Monument by the light of night. Visit the Lincoln Memorial, the Thomas Jefferson Memorial, the Martin Luther King Jr. Memorial, and the National World War II Memorial. The 3-hour tour ends with a visit to the much-anticipated north gate of the White House, then a DC hotel drop-off. This is a three hour tour including pick-up and drop-off.